Create Range vs. Quadrant Elevation tables and estimate maximum range in minutes. With Ballistic Match, projectile performance parameters can be modified quickly to achieve a desired Drop vs. Range. 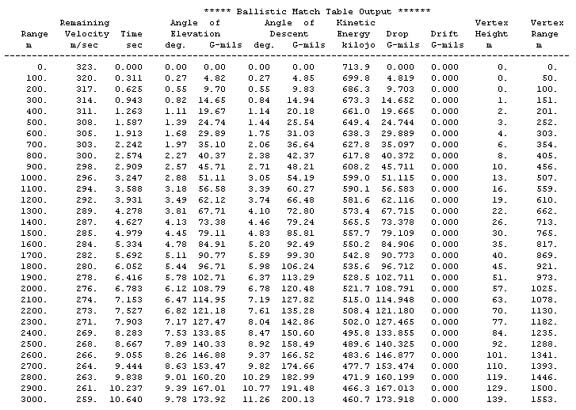 Ballistic Match runs a series of 4 DOF trajectories between 0 and 80 degrees elevation and saves impact points, impact conditions, angle of fall, and culmination ranges and altitudes. Ballistic Match automatically iterates the gun quadrant elevation, saving the designer tiresome iterations to make a bullet strike a target at a given range. The required quadrant elevations and key trajectory parameters for each range interval are saved for quick reference. Ballistic Match can be used alone, to display maximum range and quadrant elevation information, or it can be used in conjunction with the trajectory module to generate initial conditions.